Georgia lies at the crossroads of Europe and Asia, nestled between the Black and Caspian Seas with Russia to the north and Turkey and Iran to the south. The country’s geography ranges from tangerine orchards and tea plantations along the Black Sea coast through the snow-capped Caucasus Mountains in the north to the rolling hills of wine country in the east. Its position along the ancient Silk Road made it a cosmopolitan junction for merchants and travelers from the Mediterranean, Persia, the Middle East, Russia, and Central Asia. 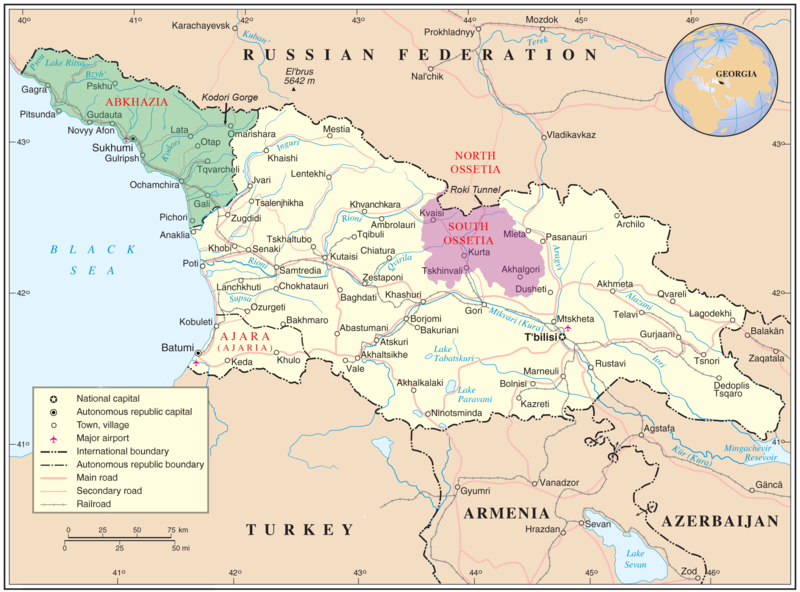 Note: Georgia and the majority of UN member states consider the regions of Abkhazia and South Ossetia to be parts of Georgia. The two regions have declared independence and are currently under the de facto control of the Russian military. This diverse history is evident in the flavors that characterize the Georgian table today, from lamb braised in tarragon and white wine to honey-scented pastries and stews redolent with pomegranate, cilantro, and garlic. Locally grown fruits and vegetables, beans, nuts, and herbs abound, making Georgian one of the most vitamin-rich diets on the planet. Georgia is also believed to be the birthplace of wine—humans have been fermenting grapes there for over 7,000 years. Grape vines criss-cross the country, and at-home wine production is still common. Georgian cuisine thrives on a balance of nutty, tart, and herbal flavors. Walnuts are used copiously, both as a flavoring and a binding agent, as are a wide variety of herbs and beans. 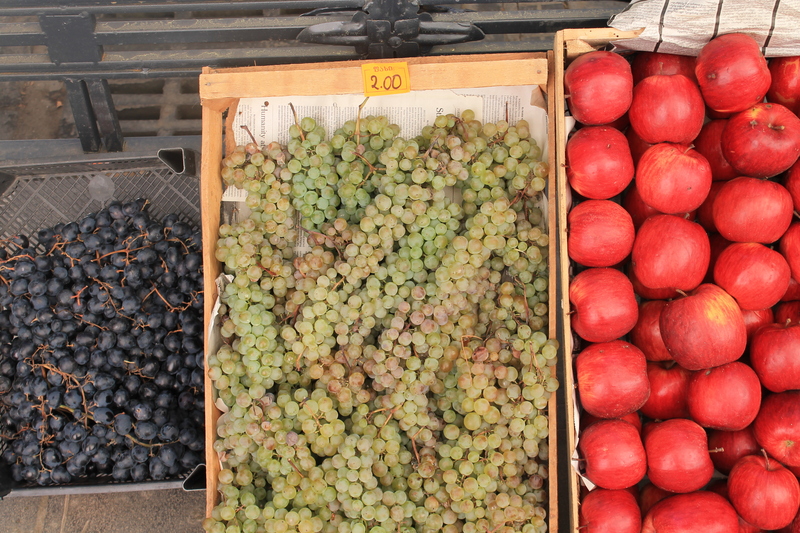 Fruits make frequent appearances in savory dishes, but Georgians prefer the tang of pomegranate, immature grape, and sour plum to the sweeter prunes and quince commonly used in Persian dishes. Each region of the country prides itself on a unique dish or distinctive style of preparing pan-Georgian specialties: you’ll find fiery spices and corn-based dishes in the west, while eastern Georgian cooking favors wheat and milder heat. The mountainous areas in the northeast are known for their lamb, while Ajara, on the Black Sea Coast, boasts a plethora of rich cheese, butter, and egg dishes. 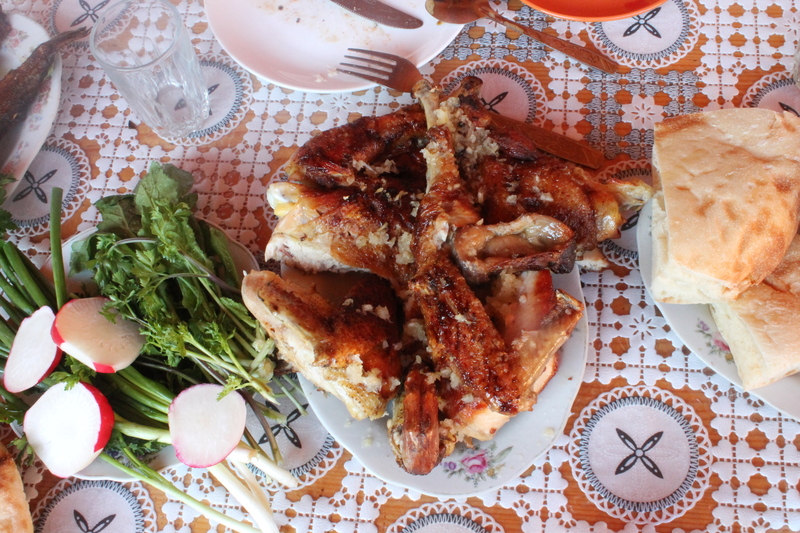 A roadside lunch of grilled garlic chicken and trout, khachapuri (cheese bread), greens and radishes in Akhaldaba, Georgia. It’s not hard to find “slow food” in Georgia, because here it is still the rule, rather than the exception. Most families–even in urban centers–maintain a connection to the land through their ancestral homes in rural villages. 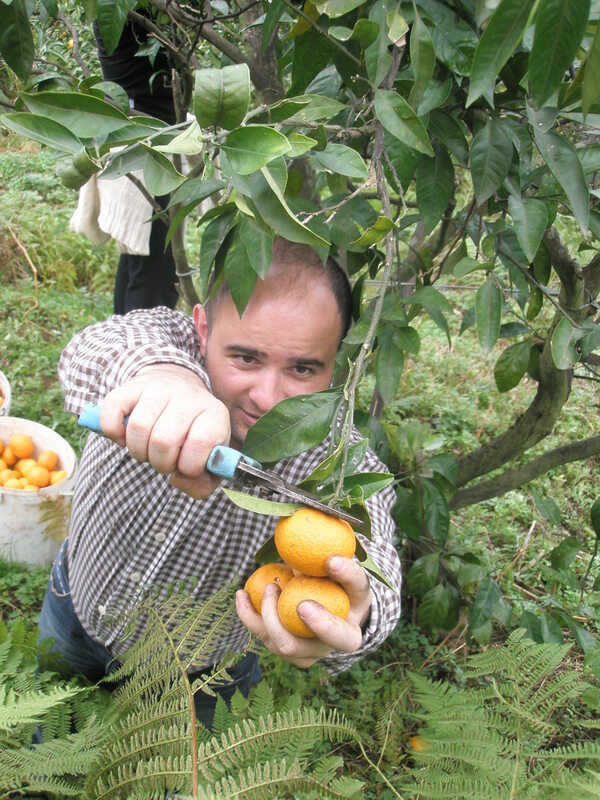 There they maintain small orchards of mandarins, apples, figs, plums, and persimmons. They may grow potatoes, peppers, eggplants, tomatoes, and other vegetables in a garden, and many keep a cow or two from which they make milk, yogurt, and cheese. In between village visits, people do much of their shopping at small, family-owned grocery stores where they can purchase locally produced dairy products, seasonal fruits and vegetables, and meat cut on the spot according to their specifications. A communal spirit pervades the Georgian table. Diners serve themselves from shared dishes placed in the center of the table, filling their plates with a little of this, a little of that over the course of the meal. 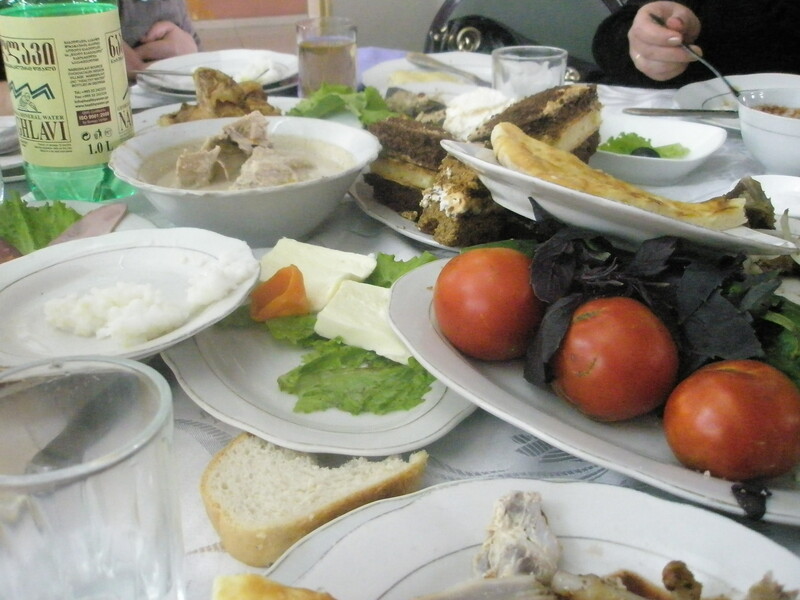 The best way to experience Georgian cuisine is at a supra, or feast led by a toastmaster. Rather than serve meals in courses, with the table cleared between each, the supra aims to shock and awe through displays of abundance. Many Georgian dishes are designed to be served at room temperature: those that must be served hot are brought out throughout the course of the meal. As additional dishes arrive, they supplement, rather than replace, the previous spread. When every square inch of available space is covered, brimming platters are piled on top of other dishes to ensure maximum visual impact. Families may hold a supra in their home to celebrate a birthday, an engagement, or the arrival of guests. High-quality restaurants serving traditional food are a dime a dozen in Georgia’s capital, Tbilisi, and are gradually springing up elsewhere as local salaries rise and tourism develops. For an authentic Georgian dining experience, order several dishes for the table and share them all. Wineries may also offer a dinner of traditional dishes as part of their visitors’ package, sometimes accompanied by a private concert of folk singing and dancing. Just came across your blog today, and what a treasure it is! I don’t actually remember when I first came across Georgian food, but it struck me from the moment I read about it, due to the similarities to Persian food I could taste in my mind reading recipes! It was only later that I found out (from a cookbook) that Georgia was at one time part of the Persian empire. Anyway, I wondered about your comment above about Persian cuisine preferring sweeter fruits in savoury dishes than Georgian cuisine does. The overwhelming favourite flavour profile in Persian cuising is sour, with pomegranate, lime and verjuice key souring agents in many dishes, and tart cherry and Seville orange used as ingredients in many more, probably more than prunes and quince which, while used, I think might be more common in Morocco, that other meat-n-fruit powerhouse. One of the most intriguing Persian-Georgian similarities for me is the walnut-pomegranate combination. I havent yet got to the bottom of where it originated, but my best guess is that it’s Georgian, since it appears more frequently there. Any thoughts?